If you are a royalty owner in North Dakota or Wyoming, you very likely disappointed by the sharp drop in your royalty payment received last week. It is no surprise to anyone that oil prices fluctuate daily, but the recent drop from near $100 dollars a barrel to less than $40 has been a little much. However, the good news is we appear to have found the bottom and even better news is that we just might be heading back up. 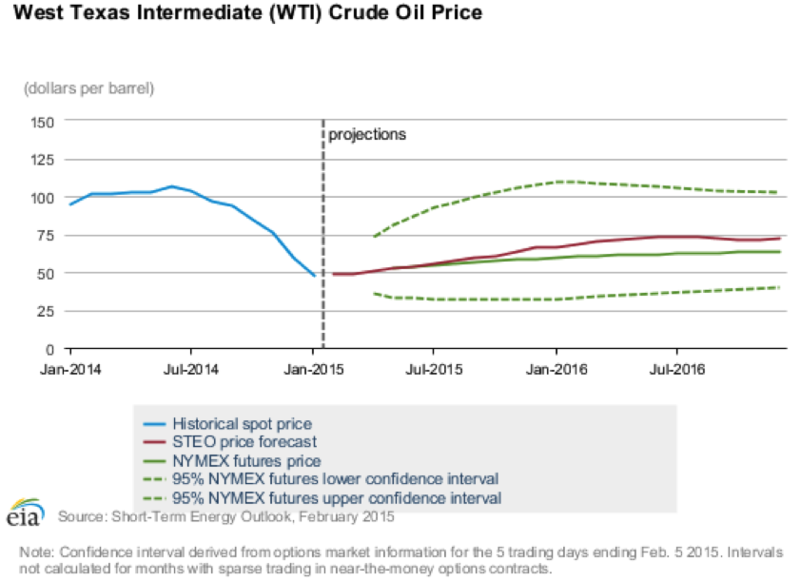 Are oil prices on the rise? The International Energy Agency recently reported that the price of crude oil is predicted to be mostly flat the first half of 2015 and average $55 dollars a barrel in 2015. If crude oil is to average $55 dollars a barrel in 2015, we should see WTI in the high $60’s and low $70’s by year end. If you look at the graph below, the red line is the projected price, while the green dotted lines are the possible predictions with a 95% certainty. In statistical terms, this simply means that prices are predicted to fall on the red line but if not, they are expected to fall in between the two dotted green lines. Additionally, a recent article from the Wall Street Journal suggests that OPEC is predicting more oil will be needed from Petroleum Exporting Countries. This is a reversal in that previous predictions were focused on a decline. What does this mean for you as a royalty owner? It means that if oil prices are on the rise, your royalty income will rise along with it. It also means, new wells could be put back on the drilling schedule, leasing activity will once again increase and for those looking to sell their royalties higher prices. We still have a long way to go to get back to $100 oil. The shale boom we have seen over the past few years may look like something very different when this is all over. Many companies who have been in the Bakken for years are selling off assets and in the next six months overall production and activity will continue to decline. It will very likely be late 2016 before the landscape in the North Dakota and Wyoming begins to look like something familiar. Hang in there…..